Director – David Fincher, Screenplay – Larry Ferguson, David Giler & Walter Hill, Story – Vincent Ward, Producers – David Giler, Walter Hill & Gordon Carroll, Photography – Alex Thomson, Music – Elliot Goldenthal, Visual Effects – Boss Film Studios (Supervisor – Richard Edlund), Special Effects – George Gibbs, Alien Effects – Alec Gillis & Tom Woodruff Jr, Makeup – Greg Cannom, Production Design – Norman Reynolds. Production Company – Brandywine. Ripley is the only survivor when the Sulaco crashlands on Fiorina 161, a prison planet for hardened criminals. Most of the prisoners have taken oaths in a monastic order and are suspicious of her for the temptation that she, the only woman on the planet, presents to their vows of celibacy. However, the Sulaco has also carried one of the aliens with it and it quickly gestates and starts to claim victims while hiding in the planet’s complex of shafts. 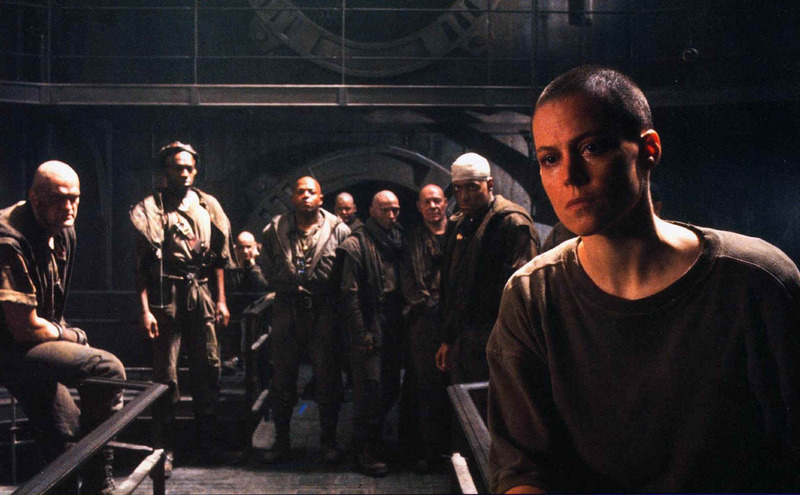 Ripley tries to organize the prisoners to fight, only to find there are no weapons on the planet. She then makes the horrifying discovery that she is carrying an embryo of the alien queen inside her. Alien³ was a project that was aptly described as being from development hell. In its six years of on again/off again production history, the project started to resemble a creative revolving door. Connected at various points were directors like Ridley Scott, director of the original Alien (1979); Renny Harlin, director of Die Hard 2 (1990), Cliffhanger (1993) and Deep Blue Sea (1999); and Vincent Ward, the New Zealand director of The Navigator: A Mediaeval Odyssey (1988) and What Dreams May Come (1998), even Clive Barker, before the final choice of the then unknown David Fincher who up until that point had only directed music videos. Even more striking was the endless progression of script rejections. Cult science-fiction author William Gibson, author of films like Johnny Mnemonic (1995) and New Rose Hotel (1998), delivered one involving a colony of Marxists and a genetically-engineered alien mutation loose on an interstellar mall world; Eric Red, author of The Hitcher (1986) and Near Dark (1987), set the alien loose on a space station of redneck farmers; while David Twohy, the director/writer of Pitch Black (2000), came up with a version set on a prison planet, which was then abandoned. The most fascinating of these was the one planned by Vincent Ward, which was set on a wooden planet inhabited by a lost colony of monks who saw the mutating alien as the fulfilment of religious prophecies – a version that seemed to enter more into fantastique horror than science-fiction. Added to these problems was much debate about Sigourney Weaver’s involvement and her demands for character input. Even the shooting of the film was rent with problems with David Fincher so unhappy with production interference that he left before editing was completed and subsequently refused any involvement, even in producing his own director’s cut. So it is with great surprise that the finished film comes out far better than the behind-the-scenes chaos would have led one to believe possible. If one can set aside the central implausibility the film requires – that the whole story is going to happen a third time over – and the somewhat disappointing scaling down of the scope of the action from the second film – there is still a good film left. The surprise is that Sigourney Weaver’s input does benefit the project and that Alien³ works as a strongly character propelled film. In fact, it is the giving of substance to the central character that forms the best parts of the film. This allows Sigourney Weaver to deliver a tour-de-force performance, turning Ripley, previously a hardheaded pragmatist, into someone who has been left a burnt-out emotional wreck by her experiences. In one stunning moment, she confronts the alien in the dark and whispers, “You’ve been in my life so long, I can’t remember anything else.” The character development does lead to what is a valid criticism – that the film has a slow-moving beginning. Indeed, it is a considerable surprise, after the previous two Alien films, to see David Fincher taking his leisure before letting the alien loose. The question that was on everybody’s lips at the time that Alien³ was “Could the then unknown David Fincher establish a style of his own or would he merely repeat what has gone before?” The answer is happily the former. With the darkly textural jack-in-the-box story that Ridley Scott provided in the first film and James Cameron’s barrelling powerhouse bug hunt in the second casting an enormous shadow over Alien³, David Fincher has his work cut out for him, nevertheless manages to stamp his own imprint on the series. Fincher shoots the harshly realistic settings and scarred, pockmarked texture of the characters faces with a soft candlelit luminescence. The look of the film is often reminiscent of the Nineteen Eighty-Four (1984) remake. This is something that makes the alien’s appearances – rising up behind victims, silhouetted behind curtains in a sickbay, or momentarily disappearing in and out of the shafts – quite unworldly. The sets have been designed as a retrograde industrial wasteland, which makes an interesting combination with the film’s almost Mediaeval style – the way that the factory-like warren becomes like a monastic abbey with the prisoners meeting for conferences while seated inside pipe outlets, or set-pieces like the funeral service set against an orange glowing wasteland. The fans of the first two films gave Alien³ an excoriating reception, nitpicking everything from supposed inconsistencies in the alien’s biology to the downbeat ending. On balance though, David Fincher has created far more than a copycat sequel, rather a sequel that consistently keeps one on the edge of the seat anew and also establishes its own ground. 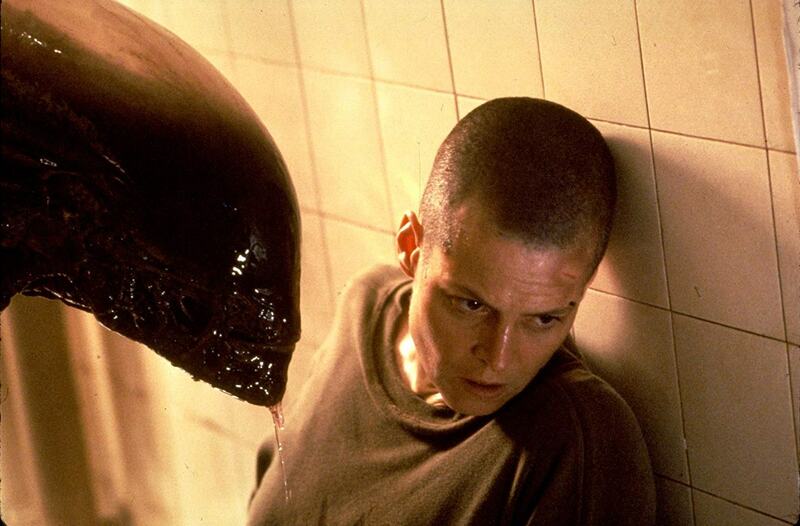 Alien³ was the debut feature from director David Fincher. Fincher went on to make the extraordinary serial killer thriller Se7en (1995); followed by the reality-bending The Game (1997); the truly amazing Fight Club (1999); the thriller Panic Room (2002); the true-life serial killer film Zodiac (2007); The Curious Case of Benjamin Button (2008) about a man who ages backwards; The Social Network (2010) about the real-life establishing of Facebook; the English-language remake of The Girl with the Dragon Tattoo (2011); and the thriller Gone Girl (2014); as well as producing the tv series Mindhunter (2017– ) about the establishment of the FBI’s Behavioural Science Unit, where he has emerged as one of the most fascinating directors currently at work in the American mainstream. The other Alien films are Alien (1979), Aliens (1986), Alien: Resurrection (1997), AVP: Alien vs. Predator (2004) and AVPR: Aliens vs Predator Requiem (2007), while Prometheus (2012) and Alien: Covenant (2017) are prequels to the original. The making of Alien³ is discussed in The Alien Saga (2002), a documentary about the film series.